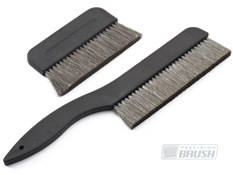 Precision Brush Company offers Conductive, Static Dissipative, Insulative or Anti-Static Brushes to fit the specific brush requirements of your particular application. Our brushes come in many styles and sizes. The metal channel strip brush is the most commonly used for dissipating and wiping, or handheld toothbrush or pencil brushes for smaller area work. ESD (electrostatic discharge) brushes provide manufacturers of electronics and static-charge-sensitive products with the ability to clean without creating static, or to manufacture products that will not create static charges. 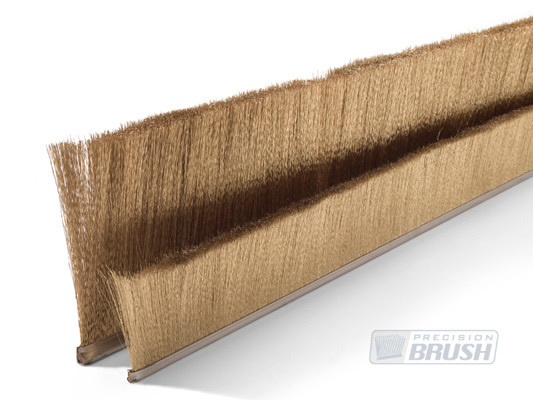 Precision Brush Company anti-static brushes can also be used in many other industrial applications such as in paper converting, printing, material handling, film processing and packaging. The classifications of Conductive, Dissipative, Insulative and Anti-Static (static charge inhibitors) are used to segregate the brushes and applications into useful groups. The type of brush you will require depends on your application, the filling and properties of the brush and the surface resistivity required for your application. When mounting a brush it should be connected to an electrically-continuous earth ground incorporating a 1 Mega 0hm resistor between the brush and an electrical ground. Potential severe bodily harm may result from the use of a conductive brush if a 1 Mega 0hm resistor is not used. Conductive Materials allow charges to move freely across their surfaces or through their volume. Charges placed on one spot of a conductive object will flow around the object so that all parts of the object are equally charged. If a charged conductor is grounded, charges will recombine (move to ground) until the object has no charge. Conductive materials have a low resistance to current flow. A common misconception is that conductive materials do not generate charges–this is because the dissipation of static charges from grounded conductive materials tends to be complete and rapid. Ungrounded conductors can generate and hold static charges. Dissipative Materials allow charges to move slowly across their volume. Charges placed in one spot on a dissipative object will flow around the object so that all parts of the object share the same charge. If a charged dissipative material is grounded, charges will recombine at a slower rate until the object has no charge. Dissipative materials have resistance to current flow that is greater than conductors, but less than insulators. Insulative Materials do not allow charges to move across their surfaces or through their volume. Charges placed in one spot on an insulative object will stay in that particular location. If a charged insulator is grounded, charges will not move to ground. Grounding is not an effective method of neutralizing insulators. Insulators can have both negatively and positively charged areas on the same object. They can also accumulate massive amounts of charge because they do not allow charge movement. However, they will gradually become neutralized through recombination with free ions. Antistatic Materials, as defined by the EIA and the ESD Association, refers to the property of material that inhibits triboelectric generation of static charges (generally less than 200 volts). These materials would be near neutral (cotton) in the center of the Triboelectric series. Materials on either side of cotton generate some static charges, but in very small amounts. A material’s antistatic characteristics do not necessarily correlate with its resistivity. An antistatic material can be conductive, dissipative or insulative. Only antistatic or dissipative antistatic materials should be used in an ESD safe area. Only contact with a conductive material can damage a charged device. Static Charge A static charge is generated between materials through friction, pressure or separation of two materials, one of which typically being non-conductive. This process is called the Triboelectric Effect. A material that inhibits the generation of static charges is classified as antistatic. Some antistatic materials used to make brushes include wood, hog bristle, horse hair and goat hair. These materials can be used in ESD-sensitive areas as long as the brush remains in a liquid environment. In a dry and safe ESD environment, only conductive or dissipative materials should be used. Polarities are dependent upon atomically thin surface layers, which can change. Therefore, your particular materials may not be in the same order if you make your own list. It is best to choose two materials which are far apart on the list, so that you can be fairly sure that their polarity will align with your expectations. Since most materials are not flat enough or flexible enough to attain large-area contact, they usually don't become very strongly electrified when simply touched together. For example, when filaments are used on plastic, it helps greatly if you drag the filaments across the plastic surface. Among other things, this acts to increase the total contact area. Some surfaces, however, such as adhesive tape or plastic sheets, CAN attain intimate contact over a large area, and DO exhibit strong charging when they are simply touched to another surface and pulled away. Note: Friction DOES play a part. For example, the ordering of the triboelectric series is different when surfaces are rubbed together rather than simply touched. The order of the series also changes when surfaces of differing roughness are rubbed together. Even IDENTICAL substances can generate a charge-imbalance if one surface is rough and the other one is smooth. This is likely why different references give different orderings of the series--the experiment must guarantee that no rubbing occurs, otherwise results will vary from trial to trial. An ESD/EOS brush can be an active or a passive static eliminator. The active ESD/EOS brush works because, in the process of mechanically brushing the potentially charged surface, the use of conductive brush fibers and a conductive brush backing allow the static charge to flow to ground through conduction. An ESD/EOS brush can also be constructed as a passive static eliminator with an air gap between the fiber ends and the charged surface. A charged surface will have an electric field emanating from it. In most situations the electric field will be uniform and perpendicular to the surface. However, if a sharp point is brought into the vicinity of the field, the field lines will concentrate at the point. In situations where the point is sufficiently sharp, the value of the electric field gradient at the point tip will be greater than the breakdown strength of air [3,000 volts per millimeter]. This causes the air molecules in the vicinity of the point tip to ionize, which is known as the corona effect. Since the ions are also subjected to the electric field, ions of one polarity [opposite the charge polarity of the surface] will travel along the electric field lines to the surface. This will reduce the static charge on the surface. The opposite polarity ions will travel through the passive device to ground. This process will continue until the field has been reduced to the point where ionization stops. For contact operation [conduction], performance is best with minimal spacing between fibers. For operation with an air gap [induction], performance is best with a space between the fibers and with the filaments spread out at the fiber ends. Some ionization will take place even when the fibers are in contact with an insulated surface. Some charge will be removed through direct contact and the surrounding charge will induce ionization at the fiber tips. The most critical aspects of the EOS/ESD brush are the brush filling, the brush backing material and the grounding. The characteristics used to evaluate the electrostatic properties of the brush filling and the brush backing are surface resistivity, volume resistivity, static decay rate and dielectric strength. Surface resistivity is the most commonly used evaluation characteristic. Surface Resistivity (EOS/ESD S11.11) This test measures the ability of current to flow over the surface of a material. Volume Resistivity (ASTM D 257) The volume resistivity of a material is its ability to resist the flow of electricity, expressed in ohms-cm. The more readily the current flows, the lower the volume resistivity. Static Decay Rate is how quickly a charge is dissipated from material. Most applications require static decay to always be less than 2 seconds. Dielectric Strength (ASTM 149) When an insulator is subjected to increasingly high voltages, it eventually breaks down and allows a current to pass. The voltage reached before break down divided by the sample thickness is the dielectric strength of a material. When mounting a brush it should be connected to an electrically continuous earth ground incorporating a 1 Mega 0hm resistor between the brush and an electrical ground. Potential severe bodily harm may result from the use of a conductive brush if a 1 Mega 0hm resistor is not used.